I’m Marie Segares from Underground Crafter and I’m happy to be back on Oombawka Design for the fourth post in my charity spotlight series. 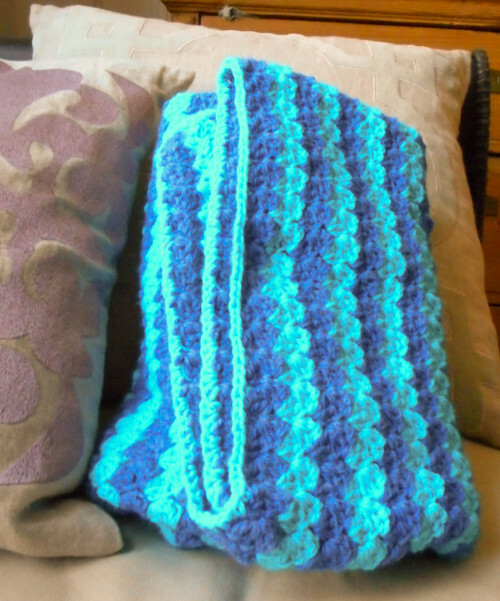 Each month, I’m highlighting a charity that accepts crochet donations and sharing a free pattern, so read on for details. Although I often recommend that people donate their crafts locally when possible, it can be an amazing experience to join a virtual group of crafters working towards helping another community. One such community that local residents and crafters have joined together to support is the Pine Ridge Indian Reservation, an Oglala Lakota reservation in the U.S. state of South Dakota. Pine Ridge’s territory includes three of the poorest counties in the United States, and its residents have a life expectancy of almost 25 years less than the average American, as well as an infant mortality rate 5 times higher than the U.S. national average. In addition, the harsh weather makes life in Pine Ridge difficult, so many local charities are in need of cold weather clothing and accessories. One website has served as a hub for people around the world who want to support the Pine Ridge community for over ten years. Friends of Pine Ridge Reservation keeps track of the needs of the various community organizations in Pine Ridge and shares those needs with the rest of the world. Perhaps because their own traditions regard the handicrafts in high regard, many of these organizations accept handmade donations. You can find links to crochet, knitting, and sewing patterns for the types of projects often needed in Pine Ridge on the Craft for Pine Ridge page of the website. Baby blankets typically experience a lot of wear and tear! Help them last longer by weaving in yarn tails securely with yarn needles, choosing machine washable and dryable yarns, and using stitch patterns without too many holes or eyelets for fingers and toes to get tangled in. As always, be sure to check the web page of the organization you are sending your projects to before shipping them off to make sure your handmade gift is something that is currently needed. Baby Blanket: 31” (78.8 cm) width x 37” (94 cm) length. 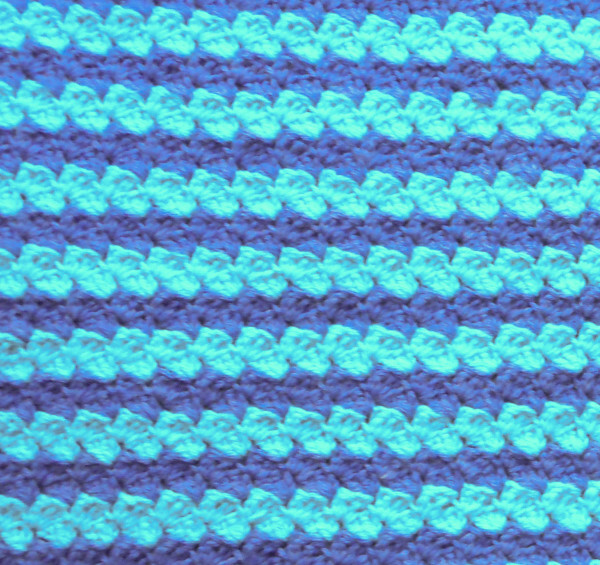 Lion Brand Pound of Love (16 oz/454 g/1020 yds/932 m/100% acrylic) – 1 skein each in 110 Denim (CA) and 148 Turquoise (CB), or approximately 700 yds (640 m) in CA and 790 yds (722.4 m) in any medium weight yarn. 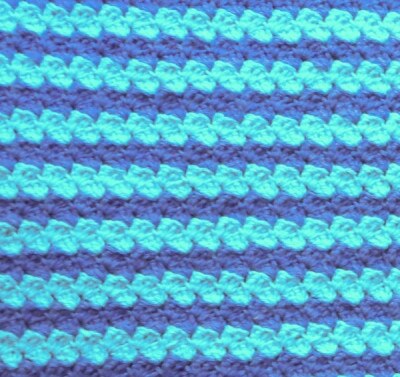 17 sts x 11 rows = 4” (10 cm) in pattern. Exact gauge is not critical for this project. Blanket is worked flat in rows. Edging is worked in the round. Carry unused color up side of blanket as you change colors. Row 1: Turn, sk 2 ch, dc in next ch, *sk 2 ch, (sc, 2 dc) in next ch; rep from * across to last 3 ch, sk 2 ch, sc in last ch. Row 2: Turn, ch 2 (counts as sc, here and throughout), 2 dc in same st, *sk 2 sts, (sc, 2 dc) in next sc; rep from * across to last 3 sts, sk 2 st, sc in t-ch, changing to CB in last yo of last sc. Row 3: Turn, ch 2 (counts as sc, here and throughout), 2 dc in same st, *sk 2 sts, (sc, 2 dc) in next sc; rep from * across to last 3 sts, sk 2 st, sc in t-ch. Row 4: Rep Row 2, changing to CA in last yo of last sc. 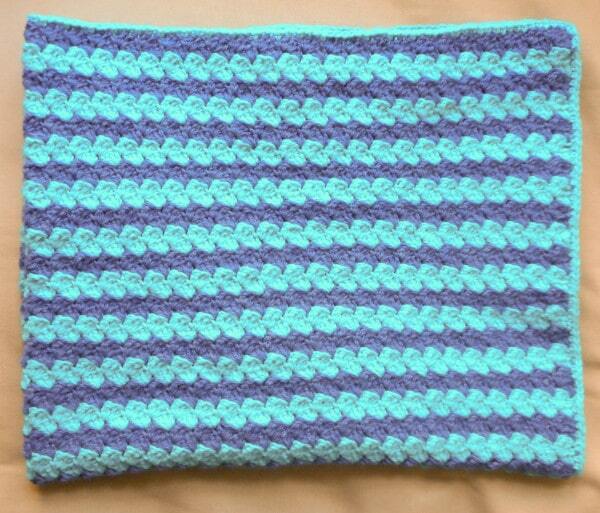 Rep Rows 2-5 19 more times, or until blanket measures approximately 30” (76.2 cm) long. Row 6: Rep Row 3. Fasten off CA and CB. Round 1: With CB and working along edge with carried yarn, join with sl st to side of first row, ch 1, sc in side of same row, 2 sc in side of next row, starting with next color change, *evenly work 3 sc in side of next 2 rows; rep from * across to last row, ch 2,** turn and working along last row, sc in ea st across, ch 2, rep from * to ** turn and working along foundation ch, sc in ea ch across, ch 2, join with sl st to first sc. Fasten off. 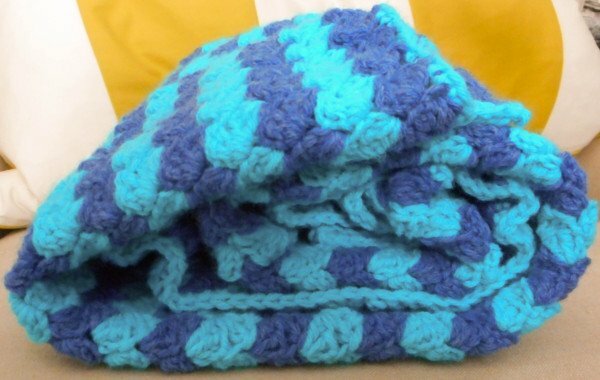 On behalf of the Oombawka Design readers, and myself, I would like to Thank Marie for sharing September’s Featured Charities: Friends of Pine Ridge Reservation and the free crochet pattern For Kyle Baby Blanket.